The bud has grown another 2 inches (5 cm) higher and 1 inch (2.5 cm) in circumference again today. 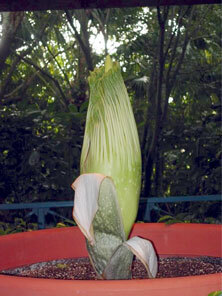 The tip of the spadix continues to extend and we anticipate its grown rate to accelerate here shortly. The protective sheaths have weakened further and are beginning to fall from the bud. Seed production on the titan arum, like everything else with the plant, is done on a grand scale. 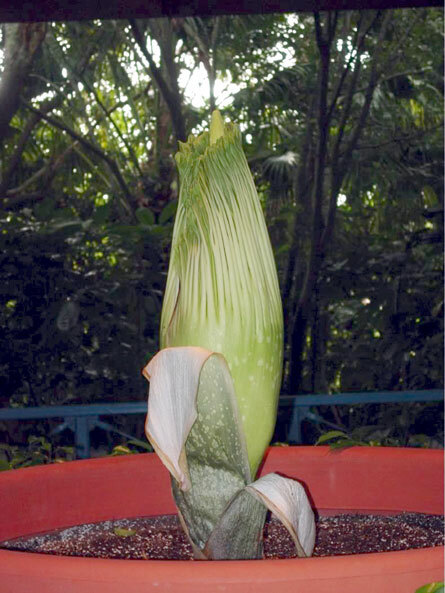 Once successfully pollinated, the spathe and the spadix will wither and separate from the peduncle (the flower stalk). The peduncle will develop into an infructescense and will top out around five to six feet tall and will be covered in hundreds of fruits that look like cherries. The fruits are eaten by hornbills and then distributed throughout the jungles of Sumatra. The seeds that gave rise to our titans came from the jungles of Sumatra and were sent to Fairchild Tropical Botanic Gardens in Coral Gables, FL. The three titans in the Disney collection were gifts from Fairchild Tropical Botanic Gardens in 1998. The image below is the infructescense that produced the seeds for the plants currently in our collection. 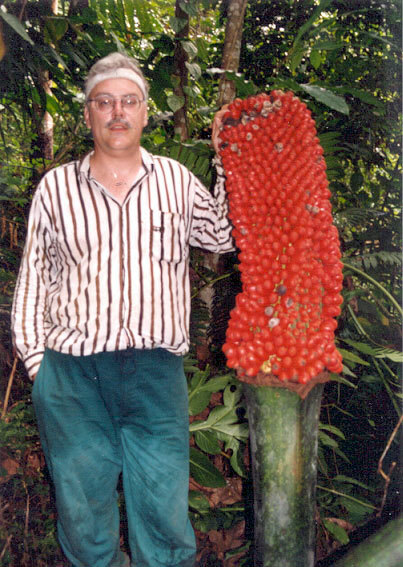 DID YOU KNOW: The seeds of the Titan Arum are distributed by Hornbills, however they are not the only animals (other than us humans) to take interest in the seeds. The Musang, a fruit eating civet (cat) has been known to partially eat the berries and place them on top of the Titans fruiting structure. (Hetterscheid, 1994). Hetterscheid, W.L.A. 1994 Sumatran Amorphophallus Adventures: 20 August-1 September1993. Aroideana 17:61-77. This page was created by Scott Hyndman for the I.A.S. on August 31, 2005.